Coordination of Carnegie Mellon and Microsoft represented an amazing technology in form of their concept product, the Skinput. Skinput is designed to target a touch responsive input interface on your own body. It seems like we see in movie or read in detective stories but it is going to be a truth now. Skinput is a device that turns your body part (hands and arms) in a touch interface for a gadget like mobile. It uses a band with pico-projector around your arm to create a sophisticated sensor on your arm. 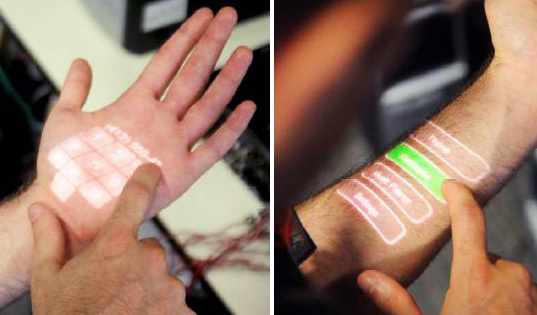 Pico-projector technology is used to build mobile phone project buttons on your skin. Projector with array of sensors collect signals to detect which area of skin is tapped and which part of touch-display to activate accordingly. Once your arm-band has worked, you can operate your mobile direct from your body. All signals are sent through Bluetooth for the mobile. It generates sounds when you tap on your touch-display skin just like it makes in your mobile. It looks like a tattoo art on your body but works much more different way. You can play songs, operate menu or any application of your mobile or even dial a number right from touching your skin. But Skinput is made to work only on hands and rams, and no where else on body. It is really an unusual form of technology to navigate menus on your mobile device. It is a conceptual product yet. I can’t help to explain more unless you see the video to see the technology in action.